NEW YORK – The future has arrived in new media covering this presidential campaign and in how the politicians are reaching the voters, leading journalists told an NPC forum here Thursday. Jill Abramson, managing editor of the New York Times, described how she was able to watch Wednesday night’s debate live on the Times’ Web site while reading instant real-time commentary blogged by Times reporter Katharine Seelye. But keeping up with new delivery methods is straining, she said. 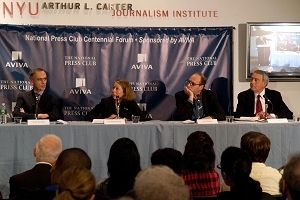 Abramson was speaking at one of the Club’s forums on “The First Amendment, Freedom of the Press and the Future of Journalism” the Club is holding around the country to mark its 100th anniversary. “It seems undeniable this 2008 election campaign will be seen as a kind of tipping point,” said former CBS anchor Dan Rather, who is now the global correspondent and managing editor of Dan Rather Reports on HDNet. “It has already earned the tag, ‘The YouTube Election.’ "
Every news room, whether broadcast or print, has felt it, he said, and opinion-makers and people who sell their opinions are responding to it. Tom Curley, president of the Associated Press, said that the candidates, especially Barack Obama, have figured out that they can get their message to the public through the new media They are less reliant on talking to reporters through traditional media. Curley, who has been involved in presidential campaigns since 1964, said that this year the news media is providing far more information to people than has ever been available. NYU media critic Jay Rosen said as the mainstream media migrates to the new media, they are finding that citizen journalists are already there with the same tools – web cams and text.